Bill Lynch, Merv Amols. Seated: Jack Pevora, chief announcer. Pictures of WJLS are here. This page was last revised on Aug. 3, 2018. This page consists of a timeline of mainly early events in the history of WJLS, Beckley, West Virginia. Corrections or additions are welcome. First, here are some facts that do not readily fit into the timeline. WJLS applied to operate a TV station in Beckley first on channel 4, then on channel 6, but lost to another applicant in each case. WJLS-FM is the oldest surviving FM station in West Virginia (although it was dark for a few years in the mid-1950s), and one of only two which have been grandfathered to operate beyond the Class B limits. When the ABC Radio Network split into four networks it had intended to use the name Personality Network for one of the four, but could not because that term was trademarked by WJLS. (It settled on the Entertainment Network instead.) 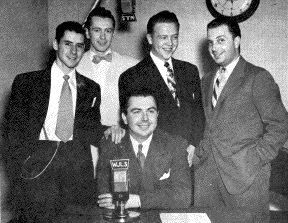 Smith also founded WKWK in Wheeling WV and WKNA (later WKAZ and WQBE) in Charleston WV, and for a time in the 1940s the stations were known as the Personality Network. In the 1940s and 1950s, monthly magazines were published--the 560 News for WJLS and the 950 News for WKNA. Mar. 5. WJLS signs on at noon. 1210 kHz, 250 watts day, 100 watts night. Studio: 3 Main St. At 2:30 a program from Charleston was carried on the West Virginia Network WCHS, WJLS, WPAR, and WBLK. Schedule: weekdays 6 a.m. to 10 p.m.; Saturdays 6 a.m. to midnight; Sundays 9 a.m. to 9 p.m. The transmitter was located in the basement of a home on Teel Road on Maxwell Hill; engineer Marion McDowell (and later Al Ginkel) lived in the home. The tower was a 198-foot Wincharger tower. Harold Dew recalls that a microphone and two turntables were located at the transmitter site for emergency program origination. The original transmitter was a composite unit, constructed on site. It went to Ronceverte for use by WRON when the Western Electric 1 kw transmitter was installed. Mar. 20. Date first licensed. The licensee was Joe L. Smith, Jr.
1939 West Virginia Blue Book lists WJLS staff: Cml. Mgr. : C. H. Murphey. Continuity: Charles Armentrout. Classical Programming: Wade H. Fleshman. CE: Marion McDowell. Transmitting Operator: Ray S. Spence. Control Operators: Jim Shott, Jr., William R. Barrett. PD: Barnes Nash. Assistant PD: George Dale. Announcers: Jonathan Goerss, Ted Ellis. Bookkeeper: V. Z. Neal. Stenographer: Esther Tiller. Custodian: A. A. Hill. Aug. 8. Granted mod. of lic. For 250 watts, unlimited. WJLS begins use of a portable transmitter for remote broadcasts. It had the call letters WAIE. Address changed to 101 1/2 Main St.
1940 West Virginia Blue Book lists WJLS staff: Gen. Mgr. : Joe L. Smith Jr. Assistant Mgr. : Charles R. Armentrout. PD: Kathryn Reddick. CE: Marion H. McDowell. Operators: William R. Barrett, Homer W. Riffe, James V. Coste. Announcers: Jack Welch, Jay O'Reilly, Don Grantham. Salesmen: Charles V. Boyd, Jack Gelder, Auditor: Virginia Z. Neal. Stenographer: Ester W. Tiler. Custodian: A. A. Hill. WJLS wins Variety's Showmanagement Award. Feb. 8. Seeks to install new transmitter, D.A. night use, change freq. from 1210 to 900, and increase power from 250 watts to 1000 watts. Oct. 25, 1940. The Charleston Gazette reports that WJLS will broadcast the high school football game between South Charleston and Mt. Hope. Dec. WJLS is one of six stations honored with a Showmanship Award by Variety. Licensee changed to Radio Station WJLS (Joe L. Smith Jr. owner). 1941 West Virginia Blue Book lists WJLS staff: Gen. Mgr. : J. L. Smith Jr. PD: H. G. Malcouronne. WJLS wins an Exploitation Award from Billboard. Mar. 29. WJLS changes from 1210 to 1240. Apr. 12. Amended to request 640 kHz, Class II, changes in DA & equipment, request limited time to LS at Los Angeles, Calif, DA from SS [at] Beckley to SS Los Angeles. Sept. 15. Amended RE: to request the facilities of WHKC, contingent on WHKC going to new frequency. Sept. 29. The licensee was Mr. Joe L. Smith, Jr., attorney-in-fact, for period not to exceed six months after cessation of hostilities or licensee's separation from armed service of the U. S., whichever is earlier. Dec. 7, 1941. Jim Wood recalled that on Dec. 7, 1941, "Downtown merchants had put up a series of loudspeakers on Main, Heber and Neville streets for broadcasting Christmas carols, but that evening they had plugged them in to a WJLS line to carry the Pearl Harbor bulletins." May 21. Amended RE: To request 560 kHz, and change in power from 250 watts to 100 watts-N, 250 watts-LS. May 15. WJLS affiliates with CBS, increases hours to 6 a.m. to midnight, 8 to midnight on Sundays. Sept. 14. Granted a C.P. For 560 kc, 100 watts, 250 watts LS, unlim. Application [as amended] granted, subject to permittee submitting proof of performance showing minimum effective field intensity of 150 mv/m for 1 kw License to cover the C.P. granted 12/14/44. Nov. 20. WJLS changes frequency from 1240 to 560, at noon; reduces nighttime power to 100 watts..
1944 West Virginia Blue Book lists WJLS staff: Gen. Mgr. : Herbert Kendrick. PD: Esther T. McManus. 1945 West Virginia Blue Book lists WJLS staff: Mgr. : V. N. Cooper. PD: Terence M. Harcourt. Aug. 29. WJLS seeks permission to increase from 250 watts to 1000 watts day, 500 watts at night, install directional antenna system at new site. Aug. 14. Beckley Mayor Robert Wriston delivers an address over WJLS at 9 p.m. regarding the announcement of the Japanese surrender ending World War II. Fall. Conditional grant for FM broadcasting issued. Oct. 4. Granted a C.P. For 560 kHz, 1kw-D, 500 watts DA-N, unlim. License to cover the C.P. Granted 8/22/47. Jan. The first issue of the 560 News is published. Feb. 1947. WJLS-FM apparently began broadcasting in February 1947. This is the date given in the 1948 Broadcasting Yearbook. The dates Nov. 6, 1946, and Nov. 15, 1946, have been cited as on air dates by the station, but there is apparently no mention of WJLS-FM in Beckley newspapers during November 1946, and in fact a newspaper article in January 1947 calls WCFC Beckley's only FM station. Also the Special Temporary Authorization requested on Nov. 15, 1946, seems to make a Nov. 1946 start date impossible, and the STA request is probably the source of that claimed date for the beginning of broadcasting. Beckley became the smallest city in the U. S. to have two commercial FM stations. The original frequency could have been 100.7, which was originally granted, but the station quickly changed to 96.3 MHz and may never have actually used 100.7 MHz. Mar. 560 News reports that WJLS-FM is now operating on a regular schedule, from 3 to 9 p.m. on 96.3 MHz. June 14. WJLS(AM) begins broadcasting with 1 kW day, 500 watts at night. Sept. 27. WJLS and WCFC(FM) simulcast Beckley vs Charleston football game from Charleston, with George Springer of WCFC and Sid Doherty of WJLS. Sponsor: Foster Hardware. Ad in Beckley newspapers invites listeners to "compare FM and AM." WJLS-FM increases power from 31,700 watts to 34,000 watts, installs 12-bay antenna; changes frequency from 96.3 to 99.5; hours of operation are 3 to 9 p.m., later 3 to 11:15 p.m.
July 6. Vol. assign. Of lic. To Joe L. Smith, Jr., Inc., eff. 8/1/48. April 3. WJLS(AM) granted a modification of C.P. To use presently licensed transmitter (Western Electric 443A-1) as main transmitter for night use and Gates BC-5B transmitter as main transmitter for day use. Virginia N. Cooper promoted from Station Manager to General Manager. Date to be determined - WJLS-FM suspends broadcasting. Most likely 1954. Early 1957. Joe L. Smith Jr. replaces Cooper as General Manager. Oct. 26. An Associated Press dispatch reports: "BECKLEY, Oct. 26 -- The beginning of operations here of FM radio station WBKW was announced today by Joe L. Smith Jr. WBKW will operate with 34,000 watts on channel 258 in the frequency modulation band. Initially, it will be on the air daily from 4 p.m. to midnight, with programs consisting entirely of music except for station and sponsor identification every quarter hour. The new radio station has made arrangements with WJLS, a 5,000 watt station here, to provide separate transmitting facilities for the broadcasting of stereophonic music, Smith said. Listeners who tune in both stations with separate receivers will obtain the stereophonic effect, he explained." Nov. 3. WBKW(FM) begins broadcasting on 99.5 MHz. Nov. 7. WJLS(AM) granted a license to use presently licensed Gates BC-5B transmitter for both day and night operation. Dec. 22. WBKW application for C.P. To install new transmitter (Gates FM-10G), install H & V antenna (Gates FMA-7 7 sections and Gates 300G-7 7 sections). [Source: FCC microfiche file] WBKW was off the air during the winter of 1965-66 until installation of the new transmitter and antenna could be completed. Feb. 17. WBKW extended authority to remain silent through 3/16/66. [Source: FCC microfiche file] J. Fred Riley, who joined the station in 1966, says the station had planned a two-week outage to replace the old single-phase, 3 kW transmitter and antenna with a new three-phase 10 kW transmitter and antenna. "But in the middle of the 'two-week outage' a blizzard hit, the power company couldn't get the three-phase lines strung. And we were off the air for a month. What a mess." June 30. WJLS(AM) adopts country music format (through 1990). WBKW(FM) adopts religious format (through 1990). Jan. 27. Vol. transfer of cont. of lic. corp. from Joe L. Smith, Jr., Inc., to Joe L. Smith, Jr., eff. 1/28/71. 24-hour operation begins on both AM and FM. Gates MW-5 installed as main transmitter. Gates BC-1H installed as aux. transmitter. Feb. 26 WJLS founder Joe L. Smith Jr. dies. Jan. 29. AM and FM formats are switched: WJLS(AM) adopts religious format; WBKW(FM) changes call to WJLS-FM and adopts country music format; network affiliation changed from CBS to Mutual. AM transmitter site moved to near Raleigh Ridge Road, south of Beckley, about September. Gray Flats site, in use since 1947, abandoned. Feb. 1. Bill and Lynn O'Brien become owners of WJLS. April. Gray Flats towers are taken down. WJLS wins National Association of Broadcasters Crystal Award. Jan. 28. The heaviest snowfall in Beckley history results in power outages which force all radio and TV stations in the area off the air except for WJLS, which provides extensive coverage of the emergency. The station undoubtedly attracted the largest listening audience in its history. Mark Reid is named general manager of WJLS. Dec. First Media Radio, LLC, announces that it will sell WJLS and WJLS-FM to West Virginia Radio Company of Raleigh, LLC for $4.5 million plus a time brokerage agreement before closing. Fred Persinger is named general manager of the station. Jan 21. Programming begins from the new studio location in the Bair Building. Feb. WJLS-AM switches from religion to a mostly talk format, airing Oldies Country in the evenings. Feb. 16. WJLS-AM begins simulcasting on an FM translator W281AJ on 104.1 MHz. WJLS-AM begins simulcasting its programming on WSWW-FM, licensed to Craigsville.